I understand Burnley are interested in bringing Karlsruhe striker Rouwen Hennings to Turf Moor. The 27-year-old has been a target for Championship rivals Sheffield Wednesday, who had a €2.5m bid rejected last month. 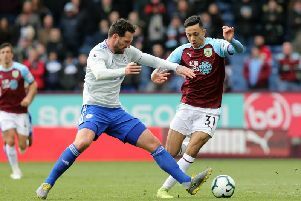 But the Clarets are hoping to push through a £3m deal for Hennings, who netted 18 goals in 29 games last season to finish top scorer in Bundesliga 2, helping Karlsruhe finish third. Hennings added a goal against Hamburg in the promotion/relegation play-off game, though Hamburg prevailed 3-2 on aggregate. A former Germany Under 21 international, scoring 13 in 21 appearances, Hennings has attracted interest from a number of Championship clubs, with Burnley looking to add firepower after the sale of Danny Ings to Liverpool, and the absence of the injured Ashley Barnes. Hennings started his career with Hamburg II, where he hit 11 goals in 51 games, and after loan spells with VfL Osnabrück and St. Pauli, he joined St. Pauli in 2009, scoring 10 in 52 games. A loan back to VfL Osnabrück brought a further five goals in 17 games, but his strikerate at Karlsruhe has been the best of his career, 37 in 95 appearances.